Speaking of Protocol | Making the World Polite One Person at a Time! Today's global market presents you with different cultures on a daily basis. Learn to navigate adeptly and confidently without offending others. 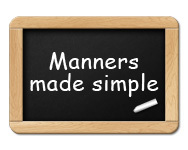 Help your students get a head start with training in good manners and decorum. All of our training can be tailored for a younger audience. Contact us to find out about custom training for your group. Get in the know with our Point of Protocol Blog! We post protocol and etiquette tips to help you navigate your social scenarios. Check out the blog today. To Tree or not to Tree…is culture the difference? The TRUTH about the turkey! Excuse me, but is your rudeness interfering with my rights?